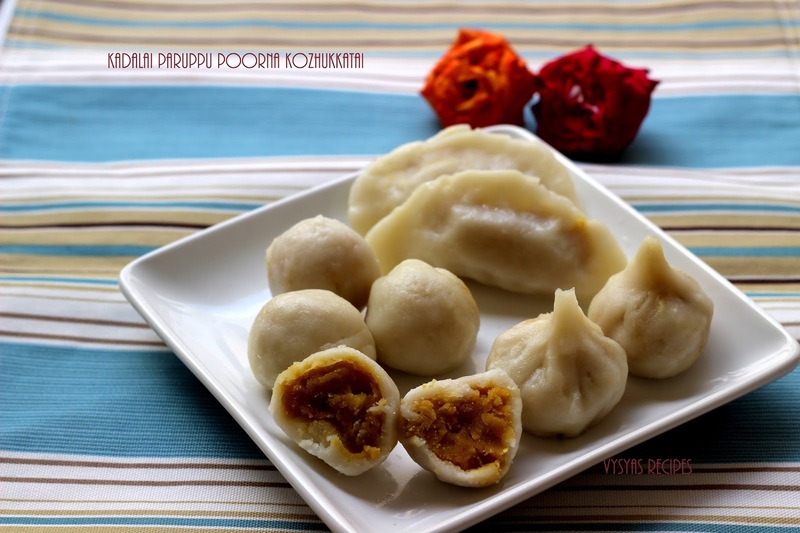 Poornam kudumulu is an authentic kudumulu Recipe, made with delicious Chanadal Stuffing Inside.It is made during Vinayaka chavithi & Varalakshmi Vratham at Andhra & Karnataka. Now we will learn to make Poornam kudumulu. Idiyappam flour/Rice flour - 1 cup. Pressure cook the Chanadal with needed water for 5 whistles, then drain the water completely. Then Grind Chanadal, Coconut & cardomom into a paste. finally add Jaggery & Grind again to a fine paste. (drizzle few drops of water, while Grinding). Heat the kadai, add 1 tbsp of Ghee add the Ground Chanadal Paste & saute for few minutes till it becomes a whole mass & it leaves the sides of kadai. 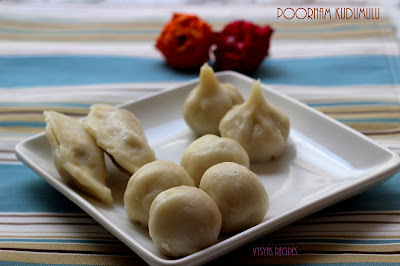 Now Poornam is Ready. Method for Outer Dough Preparation. Take Heavy bottomed vessel, add 1 cup of water, when it starts boiling,keep the stove in sim mode, add 1 tsp of oil,salt & Rice flour. Then cover the lid. Insert a long spoon or ladle,between lid & kadai as shown in the picture.Let it be in sim mode for 8 minutes. After 8 minutes switch off the stove & transfer it into a plate and knead well, to make a dough.Just sprinkle few drops of hot water to make soft dough.Finally add 1 tsp of oil and knead well.Now basic kozhukkatai dough is ready(Make sure that dough should not have even small lumps in it).Now outer cover dough is ready. Take the dough,apply some oil over hand,then divide it into equal portions and make it into small smooth lemon sized balls. (make sure that balls should not have crack in it). Then fill with chanadal stuffing. Bring the Edges together,seal properly & Shape as Round balls. Else bring the edges together and seal properly, then fold the edges as shown in the picture. Do it Gently.Now kozhukkatai shaping is ready.Repeat the same for remaining dough. Then grease some oil, over idli plate and place kozhukkatai(kudumulu) over it. Steam cook it for 10 - 12 minutes. Now kozhukkatai is ready.Allow it, to cool for 10 -12 minutes.Then serve. 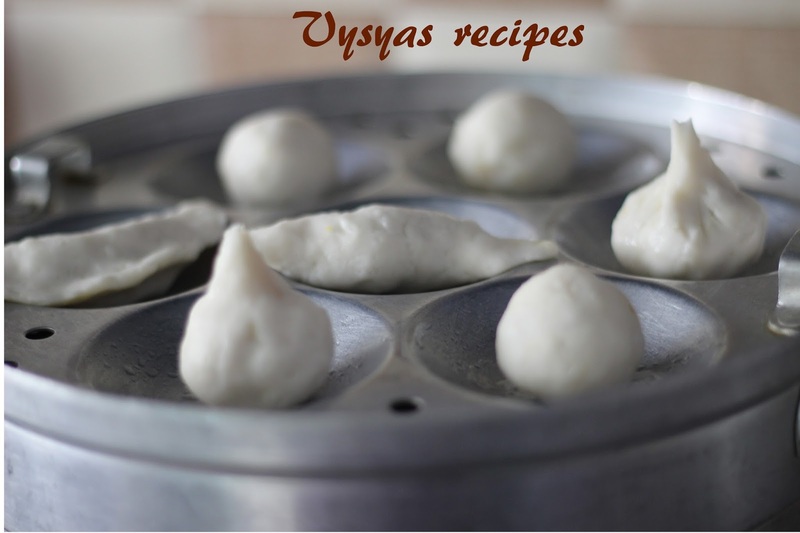 I always prefer idiyappam flour to make the kozhukkatai for best results. Inserting the long spoon between lid & kadai, makes the dough to cook evenly. I used half cup of jaggery for Poornam, if you want more sweetness add 3/4 cup of jaggery.